I’ve often found that, before God asks us to give up something huge, He prepares us by having us give up something smaller. It happened to me. Just a couple years before my husband was diagnosed with a brain tumor and declared disabled, he was laid off from work for several months. Learning to live on less at that time was great training for adjusting to disability payments. God has been doing this since the very beginning. Look at Abraham. Isaac wasn’t the first son God asked Abraham to give up. 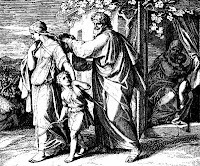 As you may recall, Ishmael is Abraham’s first son, born to him by his wife’s servant, Hagar. Now Abraham's wife asks him to kick his son out, along with his mother. Can you imagine the turmoil? Sure, this boy wasn’t Abraham’s heir, but it was, after all, his first child—his son. He wasn’t ready to just give him up. Abraham was, as God’s Word said, “greatly distressed.”(Genesis 21:11) And he hesitated. And that was enough for Abraham. He acted right away, with assurance from his Heavenly Father. This experience helped grow Abraham's trust in the Lord, which is evident in his next dilemma involving a son: this time, his promised son, Isaac. 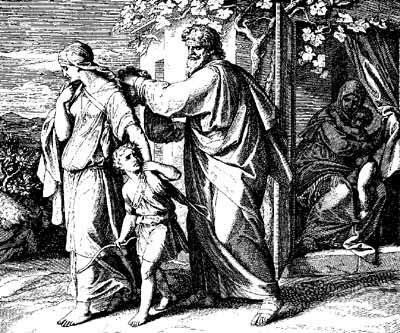 This time, Abraham acted immediately, with no reassurance of “blue skies” from his Father. In fact, the only words he heard from God were the command to take his son to Mount Moriah and sacrifice him as a burnt offering. Not very encouraging. But Abraham had grown. He trusted God even further. This time he didn’t need the reassurance. Again, he acted immediately, with the increasing faith he had developed through the first trial. May we grow in the same way. Heavenly Father, thank You for preparing us for trials beforehand, and thank You for using Abraham as an example to us about the need to trust You more and more each day. Help us, Lord, to learn through experience Your faithfulness and love. May our love for you, and our belief in your sovereignty, increase with every instance of its exhibition in our lives. In Jesus’ name I pray. Amen. Has God prepared you for a big trial by getting you through a smaller one? Did you learn from the process? What a wonderful post. Yes he did that to us when my husband lost his job and then we had to move. Through it all I knew God stood with us. Thanks, Terri! It's amazing how God works that way, isn't it? I'd never noticed this example of Abraham before. So encouraging! Although we can't see it when we are in the midst of things, it's in hindsight that we see how He has ordered our steps. I LOVE the way you phrase that, Wanda! And it's so true. Wow, Jo, not sure I want to think about your Q. I'd much rather have God work in an altogether different direction, using minor hurdles to train me for blessings. :) But that's my flesh talking, and that reveals the condition of my heart which all to often is focused on myself--my will, plans, goals--rather than the expansion of God's kingdom. Loved this post and the reminder it provided me of the need to remain teachable and pliable, seeing every encounter and event as an opportunity for growth. Oh, Jen - I am TOTALLY with you. I don't WANT to learn this way (definitely like your idea better LOL)- but it's not the way God works. And despite what you or I want, His way rules, and is best! YES - we never grow closer to Him, or more like Him, than in the struggles. My challenge is hanging on to what I learned. Taking the lessons back into the everyday, once the trial has subsided. Writing helps me do that -- helps me remember the lessons. Been there - done that. I "learn" the lesson, but the next time I need that same lesson? It's out the door. But yes, writing helps them sink in, doesn't it? Good perspective on this story. Thanks! Thanks so much for the comment, and for stopping by. Blessings! I had never looked at Abraham's experience this way. 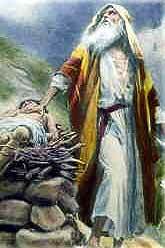 It is a new idea for me, that losing Ishmael prepared him to sacrifice Isaac. I need to think about that for a while. I always wondered why God told Abraham to listen to Sarah when she wanted Hagar and Ishmael gone. It seemed out of character. It was a moment in the story that was beyond my understanding. When I look at it this way, however, it starts to make sense. Thank you for sharing this insight. I can't look back and find specific training in bad moments that prepared me to thrive in later experiences. I will need to review things prayerfully and see if I can find this sort of thing in my own life. There certainly are bad moments and some servitude in darkness. I just never quite thought about it this way. Thank you for inspiring thoughtful self-examination. So glad I blessed you, Katherine, and made you think and look deeper into His Word and your life. It's amazing what you can learn, no matter how many times you've read the Bible (and I've gone through the whole thing at least a dozen times - likely more. Thanks for stopping by! Such a great post, Joanne! I've been blessed. Thanks, Joseyphina! I appreciate the encouragement!